Once you have enrolled in your online course, the next step is to make sure you have everything you need to access the course website the first day of class. The following section will guide you through the steps you’ll need to take to make sure your online class will be a success. Please note: Some course websites will not be “active” until a day or so prior to the first day of classes. If you can’t access your instructor’s online course website before the first day, don’t be alarmed. If your Southeast Key is active, you will have access to the course. If your Southeast Key is activated and you still have problems on the first day, don’t hesitate to contact support@cstl.semo.edu and they will be happy to assist you. All Southeast students are assigned a Southeast Key (SE Key) that will allow you access to e-mail, student web-publishing, printing in open computer labs, residential network access, and most importantly for online students, access to the portal and your online course. Although the SE Key is pre-assigned, you’ll need to activate it prior to use. You may activate your SE Key 24 hours after you have officially been admitted to Southeast. To activate your SE Key, go to https://www.semo.edu/sekey/SignIn.asp. You will need your Southeast ID number along with your day and year of birth to complete the activation process. 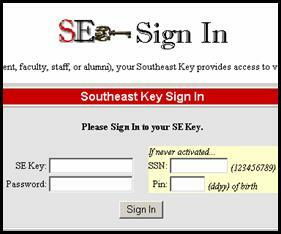 Your SE Key will remain active as long as you are enrolled in courses at Southeast Missouri State University. Your email account will deactivate the week after finals if you are not enrolled for the next semester, but will reactivate once you re-enroll.